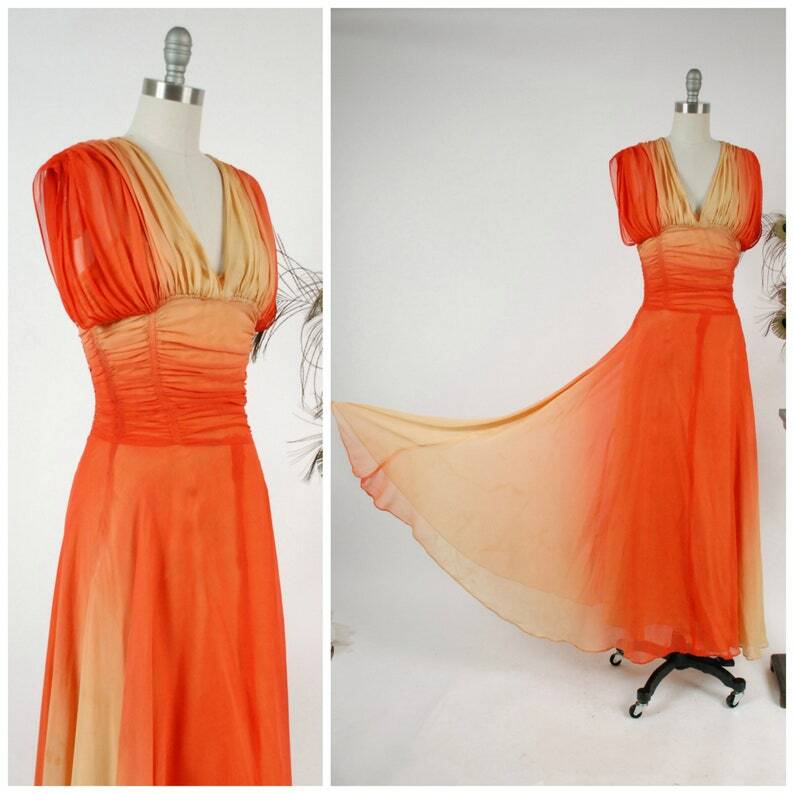 This vintage 1940s gown is exquisite, with a boldness of color it was impossible for me to capture. The ombré travels from soft gold, to a pale melon, to bold, almost blood orange color.It is shirred throughout - along the shoulder, under the bust, down the ribs, creating a ruched midwaist. Even the bust of the slip is ruched. The chiffon overskirt then opens up, using yards and yards of the saturated sunset chiffon over the butter hued lining. This splendid gown closes with a zipper along the left side, two actually. One on the attached slip and one on the exterior. This gown is clean and ready to wear. There are some areas of tanned water staining through the skirt, as well as other scattered spots.These get mostly lost when worn, but are present, and have been taken into account when pricing the gown. For an example of the skirt, see the third photo. There is a subtle water stain on the yellow at the right of the neckline. There are some small smudge type spots and two small cuts at the right front and side hip. There is an inch of ruching out on the right sholder. It wears beautifully, and is sturdy and ready to wear - the bold color helps disguise the flaws. I find no other issues to note.